Porcupine Warriors Kumasi Asante Kotoko has dared USMA in their own den. The players made their intension to beat USMA at their own backyard known to SPACE 87.7 FM on the Flight Sports this morning. When the team was reminded that their opponents eliminated ASFAG Yenega 10-3, Yussif Chibssah was not amused." Hitherto our game against Asec, they were unbeatable, yet we managed to eliminate them", he stressed. The combative midfielder said the players have reolved to enter the league stage and go ahead to win the trophy. Erlier, Dan Kwaku Yeboah of PEACE FM had told SPACE FM that the reception give to the team by the Algerian Officials was good. He said the morale in camp is very high and has no doubt that the players would give very good account of themselves on saturday. Meanwhile, Joe Hendericks who could not travel with the team as a result of difficuties in the acquisition of Italian transit visa, is expected to join the team late this afternoon. The team travelled to Algeria without some key players including Charles Taylor, Michael Asante, Aziz Ansah and Michael Osei. Whilst Taylor and Asante did not pass fitness test on time, Ansah and Osei are on trials in Isreal. 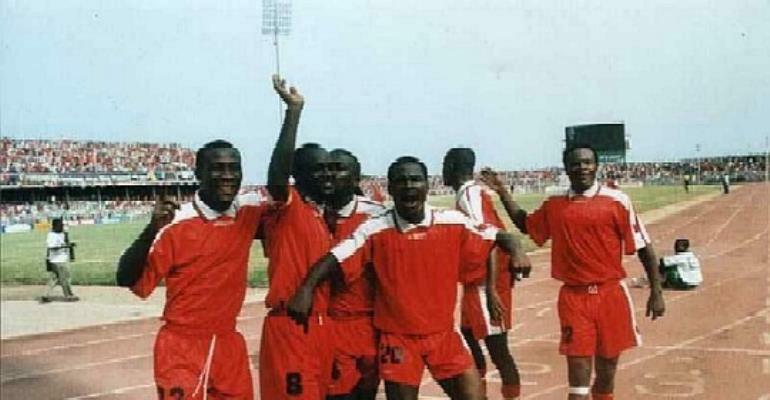 Kotoko, the one-time monarchs of African soccer is participating in the CAF champions League for the first time since the Club Championship was revised a decade ago, even though they have won the title on two occasions,in 1970 and 1983. The battle line is drawn for a cracking game on saturday at 1600 the local time (1500 Ghanaian time).